I had a more forceful title in mind, but didn't want to scare away any readers if it was obvious I would be getting onto my soapbox ;) What I also could add would be "Food Stores, Please Stop Mis-Labelling Food!!!" For many months, since our somewhat short-growing season here in Ontario ended, my family has had to listen to me complaining about stores mis-labelling produce. Specifically, it is the country of origin that they have been getting wrong. I can appreciate that it is not always possible to buy local (ie. Ontario) or even on a larger scale, Canadian, produce year round. However, I do want to have the choice to decide whether I want to purchase produce, and I want that choice to be based on accurate labelling. An example would be something as simple as fresh pears. Today at the grocery store, there was a special on "produce of USA" pears. I was happy to start bagging some up, until I saw the little sticker that indicated they were from Chile. Elsewhere in the same bin were more pears with labels from South Africa. Sorry, but all the pears in my ba g went back into the bin. I can justify buying pears from the USA, but to have travelled as far as Chile or South Africa? I'll just eat some of the canned Ontario pears I prepared last summer (not as crunchy, but a good substitute). This mis-labelling happens time and time again, even when it is pointed out to the store owners. I was once told that if there is a sale on, and there isn't enough produce from the feature country of origin available, the stores are allowed to substitute with produce from elsewhere. I have no problem with that. Just let me know that's what you're doing, by changing your signage! It's getting to the point where I don't even look at the price sign, but look for the telltale stickers. Last week, asparagus marked as "produce of Peru" actually came from Mexico, and red peppers marked as "produce of Canada" came from Spain. I would really like to see some sort of reprimanding or fining happening at the store, or even chain, level. I know, I know, "caveat emptor", ie. buyer beware, but why bother with signs if they aren't even accurate? Eating locally and eating in season is a much happier subject. I really feel that we, as consumers, have been spoiled rotten by having virtually any food (produce) available to us year round. Not only have we been spoiled, but we are enabling and justifying the thousands of miles many of these foodstuffs are travelling to make it to our grocery stores,and eventually, to our tables. Now before you accuse me of being naive, or teaching me about the "global" economy, I will point out that I am aware of all of that. Lately, there has been such an emphasis on everything "green", I am really surprised that it hasn't been extended to our food supply, too. Let's face it, being able to eat fresh asparagus in March, or fresh peaches and grapes in the cold of February is quite delightful - if you choose to. Of course, it all depends on where you live. If you are in California, or any southern climate, you are more likely to be able to buy many of this produce virtually year round. But for us here in Southern Ontario, I suggest we start to eat in season. That means asparagus is enjoyed and eaten with gusto in May and June, strawberries by the end of June, and peaches and grapes in late summer. If you take the time and effort to put some of this food away for the winter, either frozen, canned or dehydrated, then you can also enjoy it out of season. And what about enjoying the foods that ARE available in the winter months, as our parents did. Up here in Canada, winter means meals based around hearty root vegetables such as beets, potatoes, sweet potatoes, and carrots, rutabagas and turnips, as well as red and green cabbage. I won't be a hypocrite and say I never veer out of season...I enjoy my citrus fruits (but mainly buy them in the winter months, when they are in season in the States), and I also buy boxed organic greens (spinach and spring greens) that have probably travelled a significant distance. But I do try to balance those purchases by eating locally, and in season. Last summer, I sold a fabulous cookbook at the farmer's market, called "Simply in Season". I use it almost every week, as it is chock full of nutritious and de licious recipes, using produce as it is available in every season. 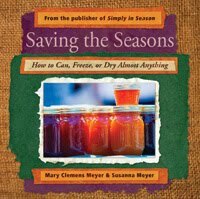 This year, I will also be selling "Saving the Seasons", which gives instructions for preserving foods in many different ways, to enjoy throughout the year. This means that we can put away food from our own gardens, but to also take advantage of the bounty that is available within our community. Last year, I purchased raspberries, blueberries, peaches and pears, and froze or canned them. We are still enjoying all of this delicious Ontario produce in our pancakes, smoothies and baking. Yes, it's alot of work, but oh, so rewarding in January! I feel so much better, getting this all of my chest, thank you....I think I'll go help my daughter make some smoothies for desert, using organic local yogurt and some yummy frozen Ontario berries!